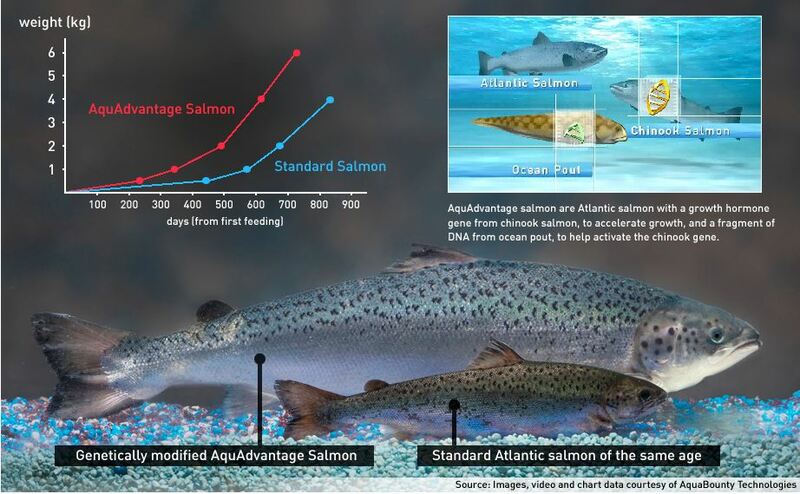 The United States Food and Drug Administration has approved the AquAdvantage salmon, a genetically modified Atlantic salmon that expresses a gene from a Chinook salmon to grow faster, after reviewing it since 1996. The additional gene added by AquaBounty Technologies enables it to grow year-round instead of only during spring and summer, so it grows twice as fast. Since 95 percent of Atlantic salmon is currently imported, and fish is promoted as part of a healthy diet, a faster-growing fish makes sense to stave off depletion of wild salmon and to boost locally-grown, sustainable farming. 4) The GE the salmon meets AquaBounty’s claim about faster growth. The FDA also assessed environmental impacts that anti-science groups had promoted and found no cause for concern. Even if they could impact other fish, they are on land-based farms in Panama and Canada. If eco-terrorists could smuggle one out they would have done it by now. When they can't block science, groups like Greenpeace and Natural Resources Defense Council seek to put warning labels on it. The FDA is accepting comments on its draft guidance regarding labels for this GE salmon starting next week. Look for environmental lobbying groups to astroturf it under pseudonyms and call it Frankenfish.